Japan has successfully landed two small rovers on the surface of an asteroid in a history-making mission that could provide clues to the origin of the solar system. 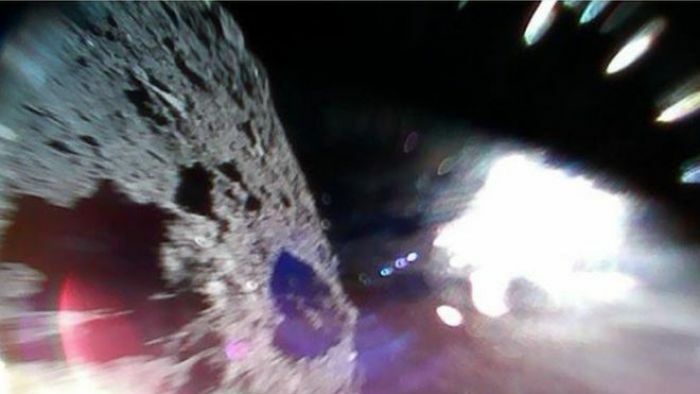 Japan’s space agency (JAXA) released photos taken by the MINERVA-II-1 rovers from the surface of Ryugu, a kilometre-wide asteroid orbiting between Earth and Mars. The JAXA team confirmed on Twitter that both survived the landing, are in good condition and moving on the surface. “The good news made me so happy,” Hayabusa2 project spokesperson Takashi Kubota said in a statement on the mission website. Many asteroids are believed to have formed at the dawn of the solar system. Scientists claim Ryugu could contain organic matter that may have contributed to life on Earth. Ryugu is a C-type asteroid — these are believed to contain the organic material and water that are considered the seeds of life. They are also the most common type, making up around 75 per cent of asteroids, but rarely make their way to Earth — so scientists have few opportunities to study their contents. By exploring Ryugu’s surface and taking samples, the Hayabusa2 mission could help scientists explain the origins and evolution of the Earth. Hayabusa2 arrived near the asteroid — which is about 280 million kilometres from Earth — in June, around three-and-a-half years since the voyage began. To lower the rovers onto the surface, Hayabusa2 approached as close as 55 metres to Ryugu, waited for one minute and then rose back to its waiting position about 20 kilometres above its surface. The two rovers will continue to measure surface temperatures and take photographs on the asteroid. They move around by “hopping” up to 15 metres at a time, because the extremely weak gravity on the asteroid makes rolling difficult. They can continue jumping as long as their solar panels and power last, JAXA said. It was during their first hops that the rovers captured the initial images of Ryugu’s surface. “With the image taken during the hop on the asteroid surface, I was able to confirm the effectiveness of this movement mechanism on the small celestial body and see the result of many years of research,” head of the MINERVA-II1 project Tetsuo Yoshimitsu said in a statement. Hayabusa2 is scheduled to attempt three brief touch-and-go landings on the asteroid to collect samples. Since the rovers landed on Ryugu, scientists have also been looking for suitable landing sites for larger vehicles on the uneven surface. The first attempt to do this is expected sometime in October. The spacecraft is then set to release a German-French lander called MASCOT carrying four observation devices in early October and a bigger rover called Minerva-II-2 next year. Hayabusa2 is due to return to Earth in late 2020.